It seems only fitting to use a quote from a musician to introduce a sketch of a music performance. 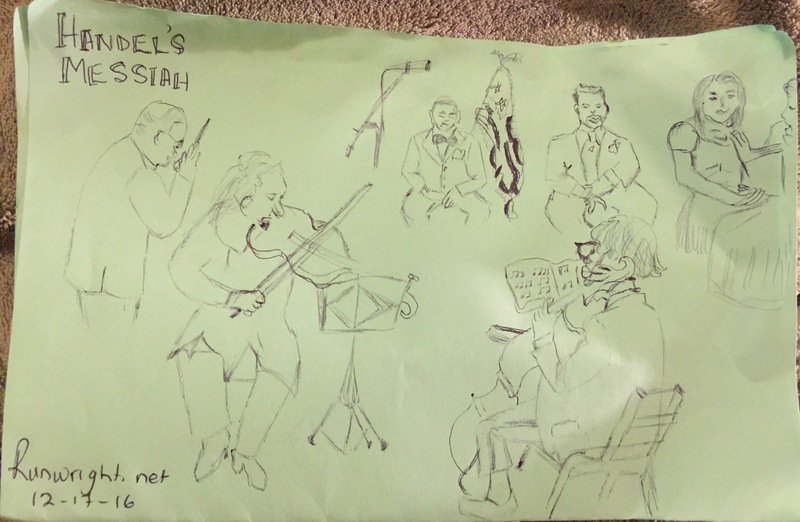 This sketch of part of the musicians performing the Handel’s Messiah is crude but it wasn’t easy to accomplish. I was drawing while one of my favorite musical performances was going on but I was so close to the string section of the orchestra it felt wrong to waste the opportunity to express my thoughts and feelings with a piece of art. Maybe one day, I’ll go back and refine the sketch, make it into something a little more like a drawing and less like a hasty courtroom-sketch but for now, it’s enough. What was your best memory today? Did you record if somewhere? Very cool! Best memory today was my husband offering to drive me in to work on a cold icy morning so that I felt safe!